A statement attributed to Al Murabitoon, an al Qaeda group that operates in North and West Africa, was published online earlier today. The message says that Mokhtar Belmokhtar, a veteran jihadist who is openly loyal to Ayman al Zawahiri, has been selected by members of Al Murabitoon’s shura (advisory council) to serve as their leader. Belmokhtar’s appointment is not surprising. Successive Al Murabitoon leaders have fallen in counterterrorism operations, so its rank and file needed a new emir (or leader). Belmokhtar was a natural fit. His men have always been a key constituency within the joint venture, which was formed when Belmokhtar’s Al Mulathameen Brigade and the Movement for Unity and Jihad in West Africa (MUJAO) merged in August 2013. 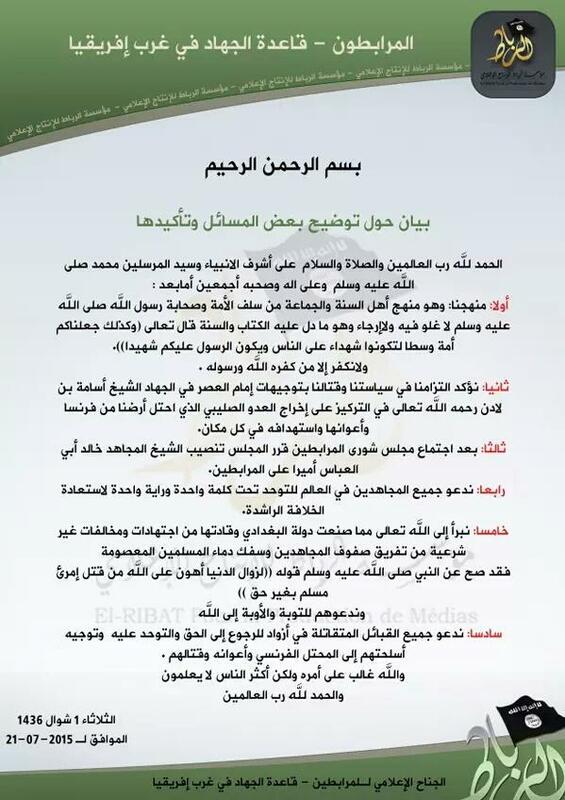 As The Long War Journal noted on July 23, Al Jazeera reported that Belmokhtar was now in charge of Al Murabitoon after obtaining a copy of the message (or a version of it). Indeed, the statement (included on the right) is dated July 21. So, Belmokhtar’s new role was already known. The message does contain one noteworthy twist, as both the top and bottom are signed “Al Murabitoon – Al Qaeda in West Africa.” This is likely intended to reinforce the organization’s enduring allegiance to Zawahiri. 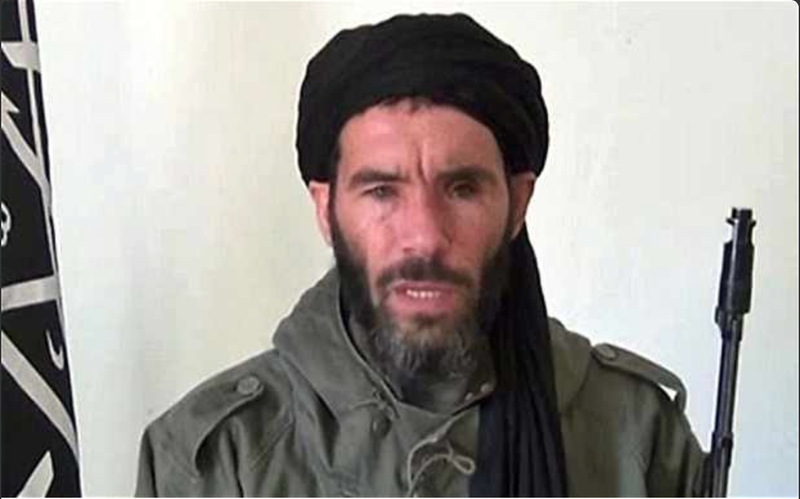 Belmokhtar was originally part of al Qaeda in the Islamic Maghreb (AQIM), but his longstanding feud with AQIM’s emir, Abdelmalek Droukdel (also known as Abu Musab Abdel Wadoud), and other leaders eventually led Belmokhtar to leave its chain of command. AQIM documents recovered in Mali show that Belmokhtar sought to establish his own direct line of communication with al Qaeda’s senior leadership in South Asia. Indeed, al Qaeda’s management sent Al Murabitoon’s first leader, Abu Bakr al Muhajir, to West Africa to assist Belmokhtar. French forces killed Abu Bakr in April 2014. MUJAO’s Ahmed al Tilemsi, who partnered with Belmokhtar to form Al Murabitoon, then took over as the top commander. But French special forces hunted down Tilemsi as well, killing him in December 2014. Al Murabitoon’s loyalty to al Qaeda was briefly questioned in May when Adnan Abu Walid al Sahrawi, a MUJAO spokesman, swore allegiance to the Islamic State’s Abu Bakr al Baghdadi. Sahrawi claimed that all of Al Murabitoon had followed suit, switching its fealty to al Qaeda’s staunch rival. It quickly became apparent that the audio message attributed to Sahrawi was not accurate, however, as Belmokhtar released a statement of his own saying that Al Murabitoon remained in al Qaeda’s camp. The missive released today further emphasizes this fact. Not only does Al Murabitoon now explicitly call itself al Qaeda, it also blasts Baghdadi’s Islamic State for dividing the jihadists’ ranks. Thus, the simplest explanation of Al Murabitoon’s use of “Al Qaeda in West Africa” is that the name removes any lingering doubt about its status in the ongoing jihadist feud. It is also possible that the group is operating as one of al Qaeda’s regional branches, or is attempting to become one. Al Qaeda has established several such branches: Al Qaeda in the Arabian Peninsula (AQAP), Al Qaeda in the Islamic Maghreb (AQIM), Shabaab in Somalia, Al Nusrah Front in Syria, and Al Qaeda in the Indian Subcontinent (AQIS). In each case, the organization is run by a jihadist who has sworn bayat (an oath of allegiance) to Zawahiri. And each branch is tasked with running al Qaeda’s insurgency and terrorist operations in its designated geography. Other al Qaeda-affiliated groups operate in each area, but they are often not recognized as official parts of al Qaeda’s international organization for one reason or another. Al Qaeda regularly seeks to hide its hand in various “local” jihadist endeavors. AQIM has operated in West Africa, but Al Murabitoon may be seeking to establish itself as the preeminent al Qaeda organization in the region. Regardless, the organization was already part of al Qaeda. In March, Boko Haram leader Abu Bakr Shekau swore his fealty to Baghdadi. As a result, Boko Haram was rebranded the Islamic State in West Africa. This provides yet another reason for Al Murabitoon to call itself “Al Qaeda in West Africa.” The name provides jihadists with a clear al Qaeda alternative to Baghdadi’s enterprise. Interestingly, another Al Murabitoon emerged in Egypt just days after the statement from Belmokhtar’s jihadists was authored. That Al Murabitoon is led by a former Egyptian special forces officer named Hisham Ali Ashmawi (also known as Abu Omar al Muhajir al Masri), who is wanted by authorities for his alleged role in a string of assassinations. Both “Al Murabitoons,” which use a similar watermark in their propaganda, are a part of al Qaeda’s international network. Baghdadi is finishing up by the sounds of it, a dead set loser, pity the poor mugs that got sucked into his BS, I accept their pious enough and ignorance is always exploited, so now its between Zawahiri and Mansour, why didn’t Murabitoon swear to Mansour since Zawahiri has apparently done so?. Belmoktar already recognizes Zawahiri as his emir. The leaders of the branches (or affiliates as they are commonly called) don’t need to swear to Mansour, as their oath to him flows thru Zawahiri. Bill, when you write about “the organization’s enduring allegiance…” isn’t allegiance an individual jihadi thing? I mean all these oaths are personal, aren’t they? I mean MBM can call his gang Those Who Sign In Blood, Al Murabitoon or Al Qaeda In West Africa and those who have sworn bayat to him don’t have to “rejoin” and reswear every time there’s a corporate name change, do they? actually within these Societies & Cultures every time there is a death of a leader or a change in leadership whatever was entered into prior to that ‘passing’ is up for renewal, renegotiation, etc.,. That is the principal position of Afghanistan behind wanting a change in status in respect to the ‘Durand Line.’ When taking the history of ‘The West’ into consideration it to not that long ago, comparatively speaking, was Governed by the same Customs, Traditions, Protocol, etc.,. Why does the US and her allies allow zawahiri to operate? zawahiri should have been a candidate for disposition matrix a long time ago? ?